Important: we do NOT encourage to use this script directly. Unity has Event System which lets objects receive events from an input and take corresponding actions. Sending events to scene objects. This script supports input module of multiple controllers. Dominant / NonDominant Event Enabled: check to enable the event of Dominant / NonDominant controller. Other Button To Trigger: other buttons used to send event. Developer can keep size 0 if just using Button To Trigger. Head: keep it empty to use default WaveVR head or developer can refer to Input Module Manager to set up other head. Fixed Beam Length: if the controller beam mode is Fixed, this field indicates the length of the controller beam. 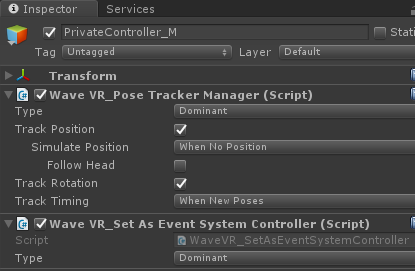 Add component WaveVR_SetAsEventSystemController to mention this controller is an Event Controller, e.g. WaveVR provides two methods for GUI being able to receive events from Unity EventSystem. In Left Menu Canvas, the Tag with value EventCanvas is used to mark GUI being able to receive events from EventSystem. 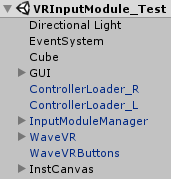 Note: if developer uses Tag, the value must be equivalent to Canvas Tag of WaveVR_ControllerInputModule. 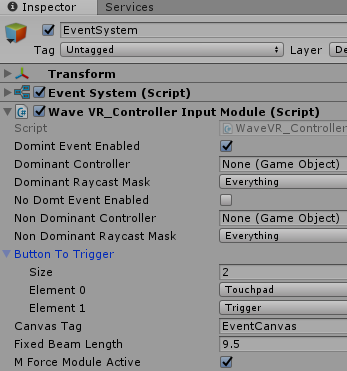 In Right Menu Canvas, the WaveVR_AddEventSystemGUI is used to mark GUI being able to receive events from EventSystem. Before sending events, casting a ray is necessary. We use GraphicRaycaster for GUI and PhysicsRaycaster for physics objects. After casting a ray, event Enter will be sent to cast object and Exit to previous object. If controller is hovering on an object, Hover event will be sent. // 1. Get graphic raycast object. // 2. Get physic raycast object. // 3. Exit previous object, enter new object. When key is released and GameObject is a Button, onClick will be invoked. We know that the Canvas of GUI has only one Event Camera for handling the UI events. But we may have multiple controllers and they all trigger events to Canvas. In order to make sure the Canvas can handle events from Cameras of both controllers, we need to switch the event camera before casting. Considering that a scene has multiple Canvases, some have to receive events and others are not. We only have to change the event cameras of Canvases those have to receive events. A fast way is to use Tag so we provide a text field Canvas Tag in the script. Another way is that using WaveVR_AddEventSystemGUI to mark the event Canvas. Send event Up to another object (different with current object) that has Pointer Down previously. In frames of button is briefly from pressed to unpressed. When raycasting an object, Enter will be sent. 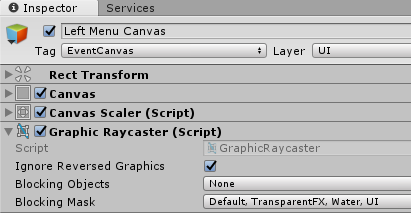 When hovering an raycasting object, Hover will be sent. When leaving an raycating object, Exit will be sent. WaveVR_ExecuteEvents is used for sending events. IWaveVR_EventSystem is used for receiving events. 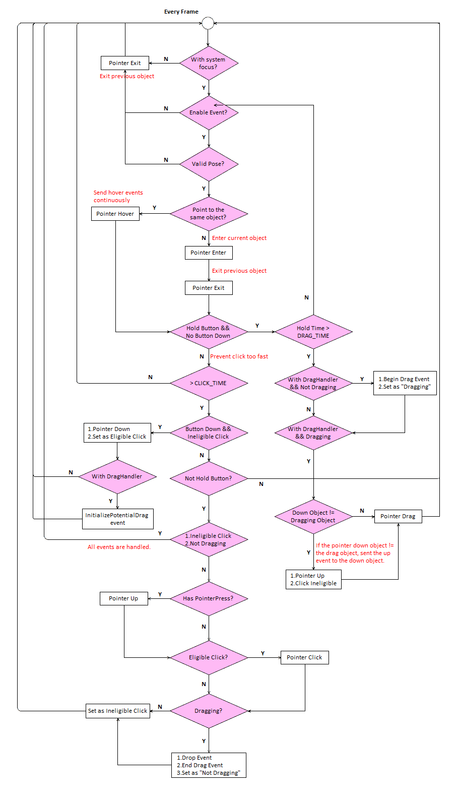 Developer does not need to implement the part of sending event, it is managed in this script. IPointerHoverHandler is a WaveVR defined event which is not part of Event Trigger Type . WaveVR_ControllerInputModule provides two modes: VR Mode (default) and Mouse Mode. Another sample scene MouseInputModule_Test demonstrate the Mouse Mode and uses Scripts/testeventhandler.cs to set UnityMouseMode in runtime.